These Wild Game Snack Sticks are is marketed as, "Super Lean", "Naturally Wood Smoked", and are made from a blend of Bison and Elk. Bison, Elk, salt, corn syrup solids, spices, garlic powder, natural flavorings. The flavors that I pick up are a smokiness, followed by a light salt. The chewing brings on the natural meat flavors while the smoke and salt increase just a touch. There's some noticeable garlic and faint traces of black pepper that linger in the background. For being marketed as "super lean" and "naturally wood smoked", these do in fact feel and taste that way. It does chew like it's extra lean in that I feel mostly all meat and not as much fat or other tissues that beef or pork sticks tend to have. For that matter, they feel just a touch more dry than Bakke Brothers' other line of meat sticks. But, there's also a rich wood smokiness to this too, but more so inside the sticks themselves, and not on the collagen casing. As for the Bison and Elk meat flavor, I certainly do pick up a light elk flavor in this. It's light enough that you might not notice it at all. The bison meat flavor is more prominent, however. Otherwise, the primary taste profile is a well-smoked, moderately salted, natural meat flavor, with a light dusting of garlic and black pepper. 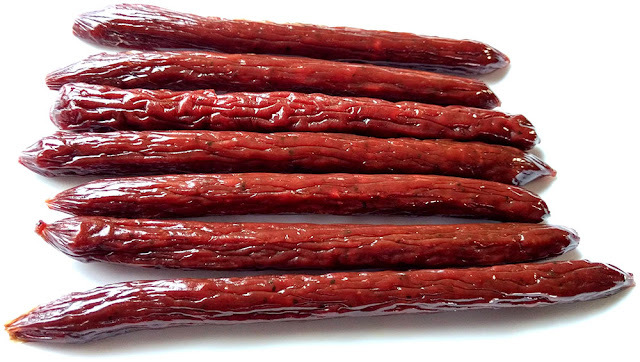 The chewing texture of these sticks are very meaty, and almost steak-like, perhaps the most "steakish" feeling meat sticks I've tried to date. I did, however, find some bits of hard, or unchewable tissues in these. Otherwise, these sticks are firm, chewy, but still easy to bite through. The casing does not offer any snap to the bite. 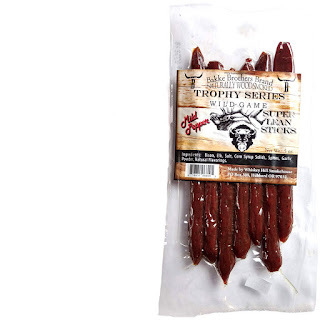 These Wild Game Snack Sticks from Bakke Brothers Brand deliver a lot of natural meat flavors with a rich wood smokiness and light seasonings. They're excellent for meat stick lovers who want to go full craft and ditch the beef/pork combos for the goodness of elk and bison. I like that these sticks are simple in ingredients, yet rich with wild game meat flavor and pleasure of wood smoke decadence. 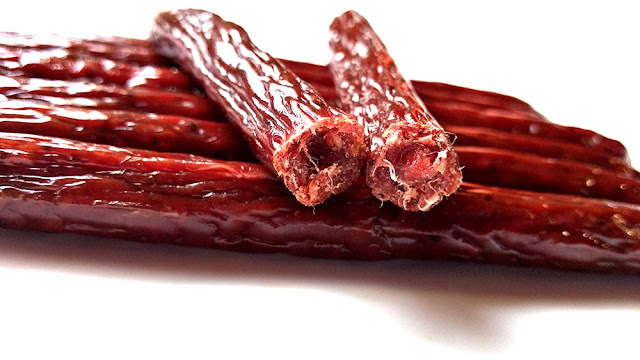 Firm to the bite, and a little chewy overall, these sticks feel meaty and almost steak-like in texture. I did find some of hard, unchewable tissues in this however, but it's hard to put down these sticks for their simple ingredients, great flavor, and meaty chewing.